Power components are usually overlooked but those who have had years of experience in this hobby know it could make all the difference. I firmly believe one cannot experience the full potential of a system until you have a quality power infrastructure in place. I’ve written a few posts in the past regarding various power cords. As far as digital power cords, I preferred the Dynamic Design Heritage Challenger AE15 for the Chord DAVE. And for analog power cables, I preferred the Shunyata Alpha HC Zitron power cable paired with the PS Audio P10. 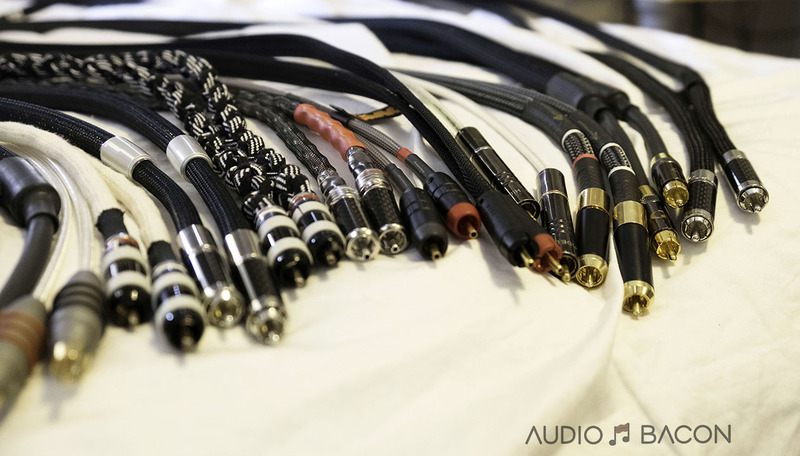 Having auditioned a few of High Fidelity Cables’s products, I was hooked and curious. These power devices are a bit different from the rest. I’ve since replaced the PS Audio P10 Power Plant with the HFC MC-6 Hemisphere power conditioner. I wasn’t able to A/B with the P10 but I have a feeling it would at least match the performance in my setup. After realizing the potential of this magnetic conduction technology, I was excited to give Rick Schultz’s other offerings a listen. So how do the High Fidelity power cables measure up to the Dynamic Design and Shunyata? What is the MC-0.5 and how does it actually work? What are the apparent benefits of the CT-1 Ultimate power cord over the base CT-1 power cord? This evaluation was done over the course of a few months. How does the MC-0.5 actually work? Yes the MC-0.5 magnetic properties do spread out into the wires behind the wall and into your system. How do they do this? Well first, one needs to understand what electricity actually is, or view it from a different angle. Let’s look at an example of something we don’t normally consider or think about. Electricity as we know it is made up of electrons and the electrons moves down the wire. That’s partly true but it’s not really where the energy comes from. Let’s look at an isolation transformer. As you may know it’s made up two coils of wire called the primary and secondary windings. 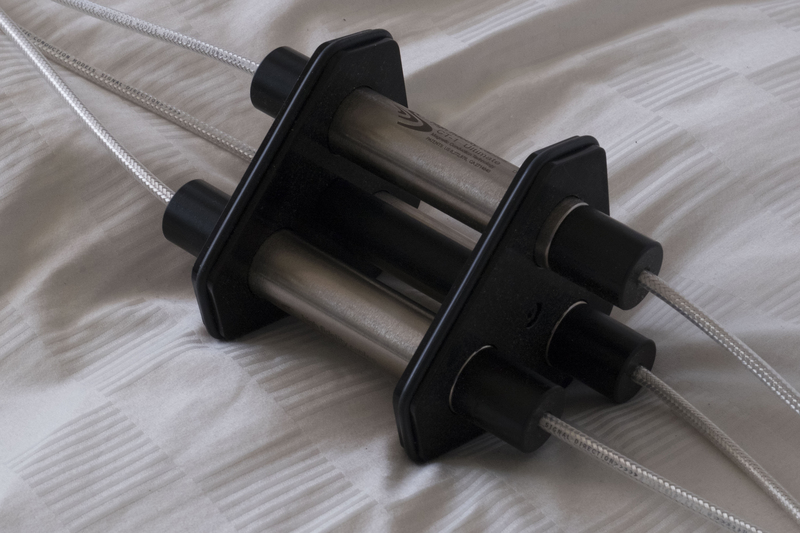 These two coils work together to isolate electricity. How does it accomplish this? Well electrons flow from the power company in through the primary coil and builds a powerful magnetic field. 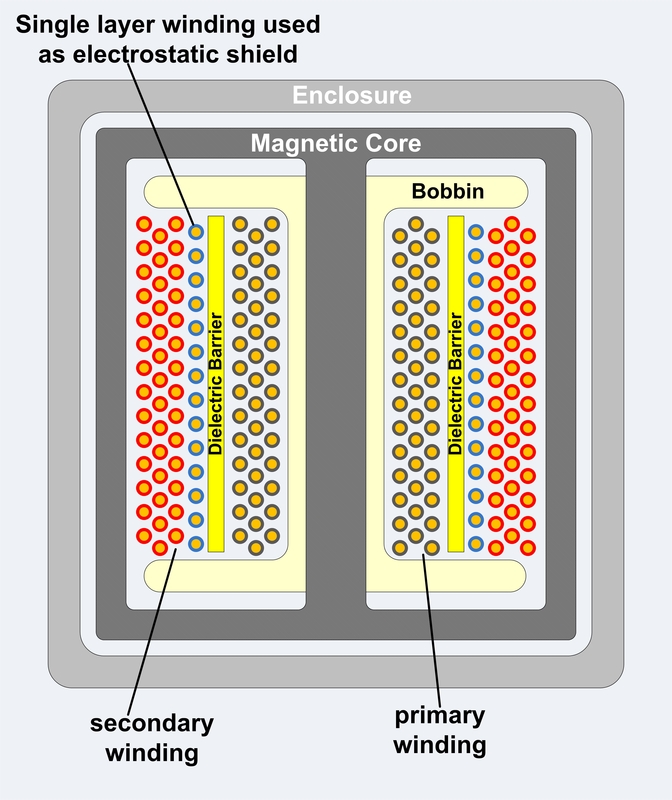 On the secondary, there is no connection whatsoever, electrically anyway, for these winding do not make contact for the electrons to transfer into the secondary coil. 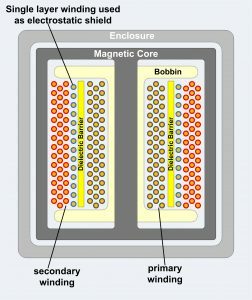 Instead what happens is the electromagnetic field that comes from the primary winding excites electrons in the secondary winding and this in turn builds electricity. In this case on the secondary unlike on the primary, there’s no source of electrons. So doesn’t this mean power is limited? Well obviously, if we consider this power doesn’t work the way most people think it does. However magnetism here becomes this infinitely powerful tool or energy that’s building electricity as we know it. So if we consider the secondary coil has no source of electrons other than the wire itself, it would seem that the wire would then have to give up electrons it would quickly deplete there would be none left. Because that doesn’t happen, that’s obviously not what happens. So we can quickly conclude power doesn’t work the way we think it does, it’s not exactly electrons flowing down a wire. Instead it is more the amount of the magnetic field on the electron that seems to make power as we know it. In physics, this is believed to be from the electrons moving, but what causes them to move in the secondary winding of the transformer? So we believe that magnetism is created by electricity but in this case something called inductance created electricity and inductance was the introduction of magnetism. You see the farther you go down this road, the more we learn that the inseparable pair electron and magnetism are really like conjoined twins. Ironically you can have magnetism without electricity, however you cannot have electricity without magnetism. So now with a new perspective, think of electricity as one great big electromagnetic grid, from a point of view of both electricity and magnetism this grid is interconnected from the power company to your home “and back”. Some of the energy goes to earth ground however most of the energy is returned to the power company, just like your stereo system only uses some of what comes into it and sends the rest back to the electrical panel, our houses are connected by alternating current from the power company, we only use some of what were given, the rest goes back to the power company. Our houses share power, each house has its own meter to see how much you’re using but it’s the same power feeding your neighbor’s house, this electromagnetism is spread for miles and miles. So now that we are connecting electromagnetism to the electrical wires in our walls and we understand that they are indeed magnets as much as they are electrical conductors. Then what happens when we change the level of magnetism or add a magnetic influence? What we know is something has to happen and if we dig deep enough into science we learn that the effects could both be quite significant but also may affect the much larger portion of this huge electrical system than we think. We like to think small because we don’t really understand what’s happening with this energy. We think of it in terms of movement that we understand. When we think of light moving it’s beyond us it’s too fast to comprehend, electricity probably works somewhere close to that fast, what we know of it is that it is relatively instantaneous. So let’s consider a garden hose and the movement of water. We turn the tap and then wait for water to come out however it takes some time we need to fill the pipe. However with electricity it’s always instantaneous. The pipe is always full so even if it’s over thousands of miles of transfer you don’t have to wait. It is still instantaneous and therefore we can assume also and correctly electromagnetism is interconnected. So speed is less likely connected to how fast electrons are moving and more likely connected to how their interconnected with one another, or some how they communicate via magnetism. So one moves at one end of a mile long wire and the other moves at the other end. So finally back to the question: How far may we influence electrons in a wire with the MC-0.5? Well after all that we still don’t know for sure, but now we can surmise it’s probably much farther than we think, it could be farther than we even dare to think. Today there’s no way to calculate it. But it’s possible, and even very likely that it could be a tremendous distance, quite simply for science today we don’t know. We only know it does influence and the greatest influence would be right at the connection and it would stray out from there, how far.. Lets just consider that it’s probably a very long way. What are the benefits of the CT-1 Ultimate power cord over the base CT-1 power cord? I had a base CT-1 power cord on the Hemisphere for all these tests. I know it’s meant to be a digital cable but this setup doesn’t draw enough power for it to be a problem. I had another CT-1 cable for the DAVE. Given the fact that the CT-1 is still the best digital cable I’ve heard so far, I didn’t expect a significant leap in performance with the CT-1 Ultimate. I was wrong. Even prior to comparing the CT-1 to the CT-1 Ultimate…I knew there was something “right” about the CT-1U. The first thought that came to mind was “effortless” followed by “I don’t want anything less than this cable.” Bottom line: The CT-1 is no match for the CT-1 Ultimate. It’s not even close. Enough said. So is it worth three times the price of the CT-1? Yes. It is. If you don’t have the budget to upgrade from the CT-1 or Enhanced to the Ultimate…you’ll probably sell your OLED TV to get it. To my ears (and my heart), the sonic differences were enjoyable enough to justify the premium in price. It moves you from goosebumps to disbelief and I find myself literally shaking my head at what I’m hearing. I can’t make this up folks. Now, from the looks of it, it just seems as if the Ultimate just has more magnetism. Perhaps I could get closer to the sound of an Ultimate by adding more MC-0.5s into the chain. Let’s find out. How many MC-0.5s paired with a CT-1 would be equivalent to a single CT-1 Ultimate power cord? 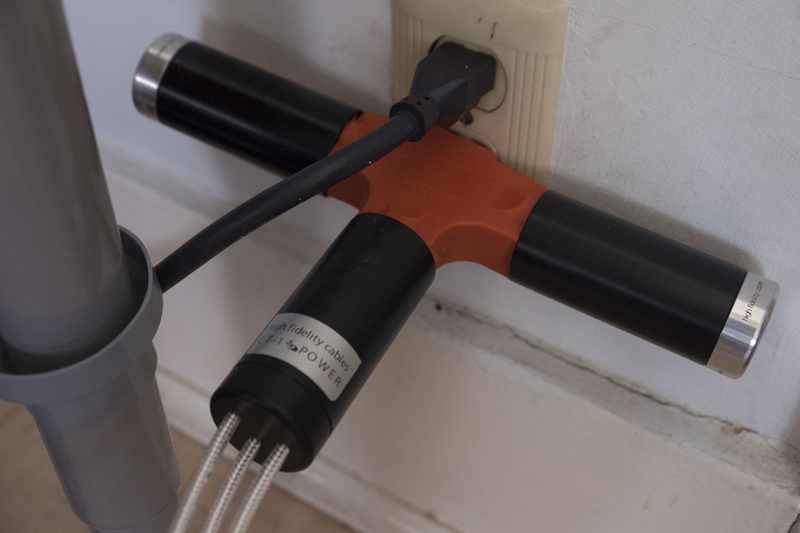 There are discussions in some forums that suggests you could simply “upgrade” your base CT-1 power cable to the higher models just by throwing in some MC-0.5s into the conditioner and the wall. That would surely prevent your bank account from taking a few uppercuts to the chin…but does it really work? The wire resonate due to the alternation of current, in a power wire the resonates at 60 Hz and at harmonics of 60 which predominantly are 30 Hz and 120 Hz. Like a guitar have different size strings at different tensions, wire do as well so although they are resonate at similar frequencies they all will ring and sound different, just like different strings on a guitar..
Makes sense! The current outlet I’m using for this review is a non-dedicated 20 amp and as mentioned in my Chord DAVE review, I had much better sound coming from my dedicated 15-amp line. Unfortunately it was too much of a hassle for me to move to the dedicated line for this review. Before I pit the CT-1 power cable and MC-0.5 combination against the the Ultimate, I wanted to find the best combination of MC-0.5s for the CT-1. For the sake of my Paypal account, I hope it makes it a fair fight. Instruments/vocals don’t seem have a natural body…perhaps just less warm? I’ve found that without adding at least two MC-0.5s, the presentation is duller and not as engaging. Bland for lack of a better word. Adding the third MC-0.5 gave the music more dimension and clarity and separation. You could clearly hear the room reflections and air in a recording. With 4 MC-0.5s, the bass was tighter/heftier, background was blacker, treble brilliance, and amazing dynamics. However with 4, I felt some details were masked in the treble (This seems to have been somewhat mitigated by connecting the MCs directly to the wall, which I’ll get to next). With four MC-0.5s, it brought the sound closer but couldn’t compete with the smooth and natural sound of the Ultimate. In this case, my intuition tells me there’s a “X factor” about the CT-1 Ultimate that cannot be reached simply by adding more MC-0.5s. That Paypal balance isn’t looking so good. When plugging the MC-0.5s into the wall, I heard an improvement over plugging it directly into the Hemisphere. This could be due to the outlet and wiring being a bit old (2-wire with a metal grounded electrical box). My guess is that more support was required at the power source (at the outlet). I’ve actually attempted to install a Furutech GTX-D Rodium receptacle but couldn’t get it to fit. A project for another day! The benefits of adding more MCs to the wall had similar benefits as it did with the Hemisphere. The biggest difference was an immediate roundedness, clarity, realism (especially in vocals), energy, and much better layering. It was quite an emotive experience. In comparison, plugging directly into the Hemisphere caused a slightly flatter and less energetic presentation. It was also a bit bright/harsh, especially with 4 MCs. I’m not sure what accounts for this difference but suspect it’s the older electrical wiring and receptacle. I’m sure having a dedicated line would help enormously. Again, another project for another day. Just the right amount of sparkle. Sounds great! Soundstage is expanded, bass is more visceral/tight, dynamics are insane, and background is pitch black. The vocals did sound a bit “stretched” but much better than having 4 MCs on the Hemisphere. So in the end, the winning combination for me was the HFC CT-1 power cord with three MC-0.5s to the wall. My fighter is now ready to take on the champion! So how did this compare to having just the HFC CT-1 Ultimate power cord by itself? Short answer: it didn’t. The CT-1 Ultimate is a completely different beast and no matter how many MC-0.5s were used in conjunction with the CT-1…it couldn’t really get close the performance of the Ultimate. 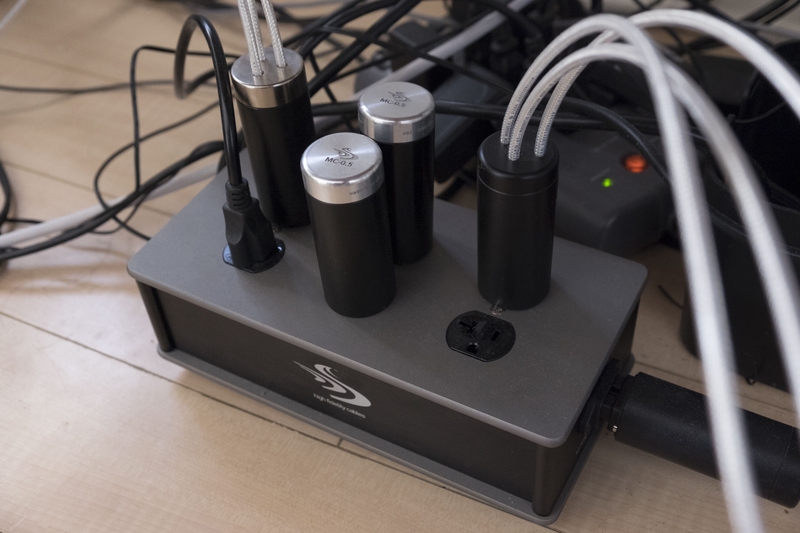 The Ultimate power cord has an innate quality that is unique to its design. It’s just so clean, delicate, euphonic, and natural. It’s just in a different league. It was a knockout in the first 5 seconds. The CT-1 didn’t stand a chance. What was I thinking? The CT-1U floated like a butterfly and stung like a bee. A true champ (RIP Ali). The CT-1U + 2 MCs just sounded like the real thing with no flaws that I could detect. Everything sounded coherent and just blended well together. The air, singers, and instruments were just amazingly synergistic. The sum of its parts made way for an incredible presentation. In comparison, the CT-1 + 3 MCs sounded a bit glued together and overly excited and a bit artificial. The vocals have ZERO “artificial fuzz” to them on the CT-1U. Even with 4 x MCs on the CT-1, it won’t be able to match in dynamics and fullness or even accuracy of the CT-1 Ultimate. There are no compromises with the CT-1U, it just sounds so intoxicating and “correct.” The thought of “How could I continue to listen to music without this cable?” was recurring and real. I don’t even think the artists themselves know how good they really sound in their recordings. When I unplug the 2 x MCs from the CT-1U setup (leaving only the CT-1U), the music loosens up in an unrealistic fashion. Everything is expanded out uncontrollably. It still sounds phenomenal and you probably wouldn’t have noticed if you didn’t have the MC-0.5s for comparison. Basically, having MCs in the chain will complement the CT-1 Ultimate very well. So at this point I figured I’ll add the other 2 MCs back to the wall (total of 4). The result was more ultra fine details and much more weighty bass and definition. There may be a bit of detail missing in the air and around the actors though. I feel as if the voices are a bit strained and you miss out on a bit of the dips. For that reason, I stuck to 2 x MCs (Maybe 3 because you get that crazy sub-bass detail and clarity/darker background). With 2 x MCs – Euphoria. Sweet voice. So emotive. So perfect. The technology used in these are actually a bit different and due to these differences there is no direct comparison. The Ultimate uses both a different magnetic application as well as a mechanical vibration control technology not offered in the MC five. In the end they both do work to achieve the same result which is lower distortion but the distortion types are different. They’re more complementary than competitive. The CT-1U is just more relaxed, honest, and more resolving of the finer details. The CT-1 and MC-0.5 combo sounds great but a bit anxious, artificial, and too excited in comparison. Interestingly enough, I felt this way comparing the CT-1 to the AE15 (with the AE15 on the losing side). Tonality is balanced and very natural. I keep mentioning this but it just sounds very fluid and feels “right.” I can’t imagine what the Ultimate Reference, Helix, or the $20,000 Professional. Holistically, what does adding more MC-0.5s actually do to the sound? From my experiments and for my particular setup, adding more MC-0.5s did add more openness, speed, energy, brilliance, detail, bass heft/definition, lower noise floor, extended soundstage…pretty much everything under the sun. The only drawback to my ears is the lack of texture and air on vocals and instruments as I scaled to four on my headphone setup. As mention, this could be due to my old wiring or even my headphones which is known to be on the bright side of neutral. I also suspect the TeraDak power supply. In any case, many believe the more you have, the better, so I would suggest you adjust accordingly and stick to whatever sounds best on your setup. Now on my 2-channel setup, having all four MC-0.5s installed was a definite improvement and wish I had more to test with. I believe Rick had over 30 of these MC-0.5s along with probably over $100,000 worth of his other products at THE Show Newport 2016. It sounded fabulous. During the live demo, when an entire Hemisphere full of MCs was removed from the chain, the music immediately flattened and lost all of its dynamics. There was an obvious loss of the fine details and especially sub-bass presence. I firmly believe in a 2-channel setup, more is probably better and chances are, unless you’re Bill Gates, you won’t ever find that limit. 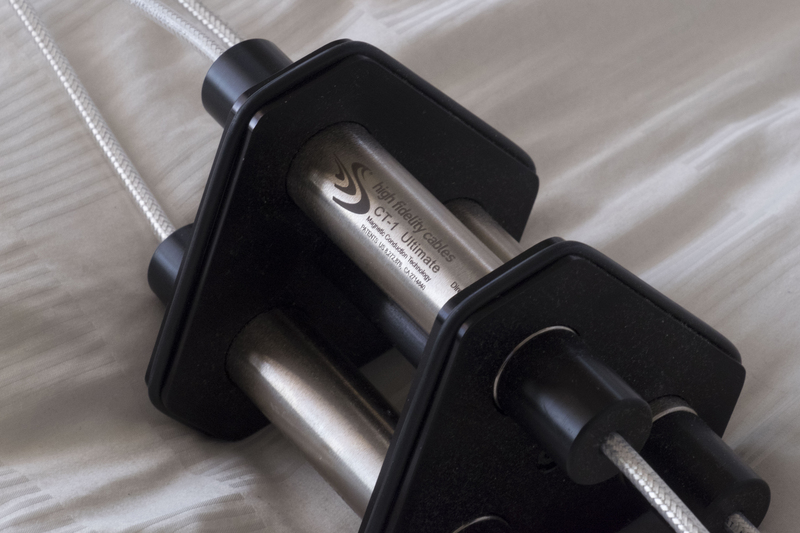 These are magical little devices are, in my opinion, a great value for the performance gained and offers a boost I don’t think you would be able to find anywhere else (thanks to Rick’s patents on this magnetic conduction technology). The CT-1 Ultimate power cord takes the CT-1 many notches higher as far as providing a much more natural and balanced sound without sacrificing punch and clarity. To be completely honest, it’s not close to being in the same league. The CT-1 Ultimate removes veils you didn’t know existed to give you a very humanistic, full, and holographic presentation. 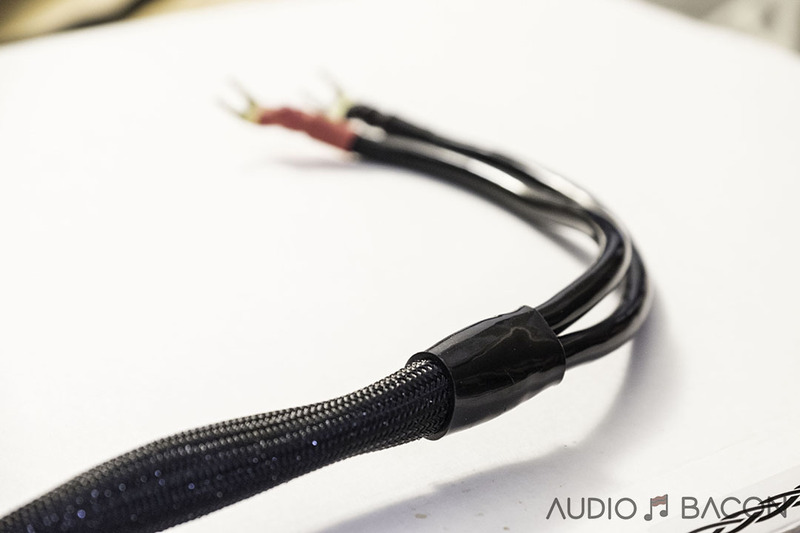 You really don’t know how “live” your recordings sound until you’ve heard this cable. No joke. The CT-1 Ultimate caught me off guard and provided the best audio experience I’ve had to date. 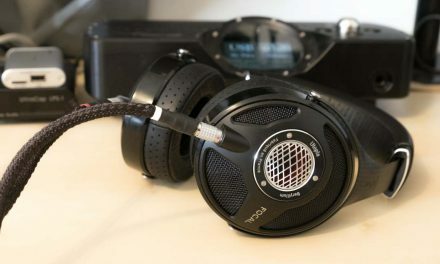 My Abyss headphones have not sounded this good…EVER. This cable has seriously sucked away a lot of my productivity as I found myself multitasking less and enjoying the music more. Woe is me. As for the MC-0.5s, it seems for many, the more MC-0.5s you have, the better the sound. In my headphone setup, there was a certain number of MCs that worked well for my tastes. You’ll probably need many more MC-0.5s for a 2-channel setups (As mentioned, the live demo used over 30(!!) MC-0.5s and it sounded otherworldly). 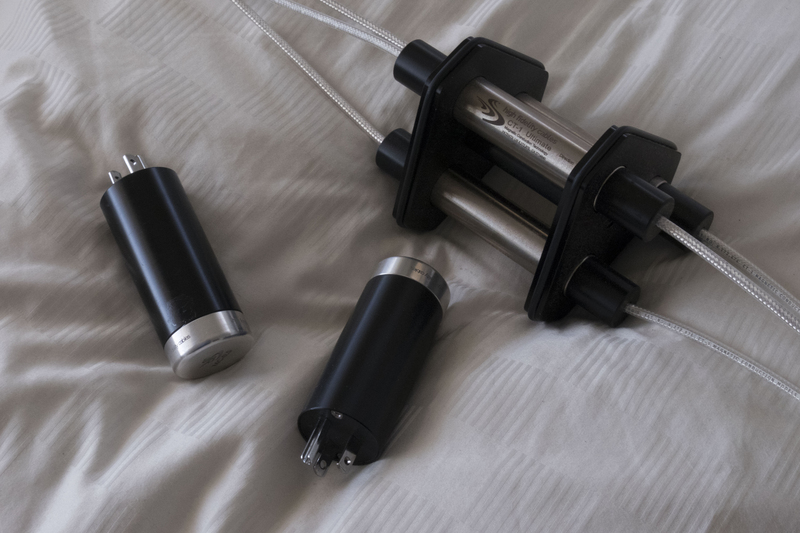 These unassuming magnetic plug devices are an relatively inexpensive way to elevate the sound of your system without much fuss. Just plug it in and get great sound. Due to this amazing patented technology, the MC-0.5 is guaranteed to offer a significant baseline improvement to any system. At the asking price, I could unequivocally say the MC-0.5s are a no-brainer. Give them a shot and prepared to be amazed at the magic of magnets. I’ve purchased a few for my headphone and home theater setups and can’t imagine my system without them. Once you’re acquainted with the signature sound of HFC’s products, you can’t go back. It’s truly a remarkable gift to the audiophile world. Update 9/25/2017: After listening to dozens of other power cords, conditioners, and accessories, the High Fidelity Cables MC-0.5, MC-6 Hemisphere power conditioner, and CT-1 Ultimate power cord remain key components in my reference system. 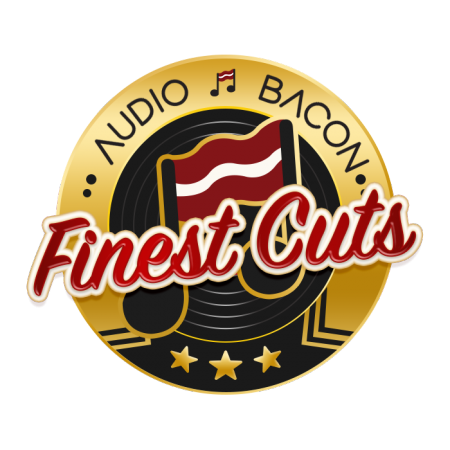 All are worthy of making the Finest Cuts, which is an award only seldom given to products that outform the compeititon and sets the industry bar for sonic fidelity. For more information on High Fidelity Cables products please take a look at their catalog here. 2 x MC-0.5s: Vocals aren’t as realistic. 1 MC-0.5: They’re still human…great balance. With the CT-1 + 1 MC-0.5, there’s still shrill and harshness in the treble. It’s not as coherent. Vocals have a bit of bright tinge to them. 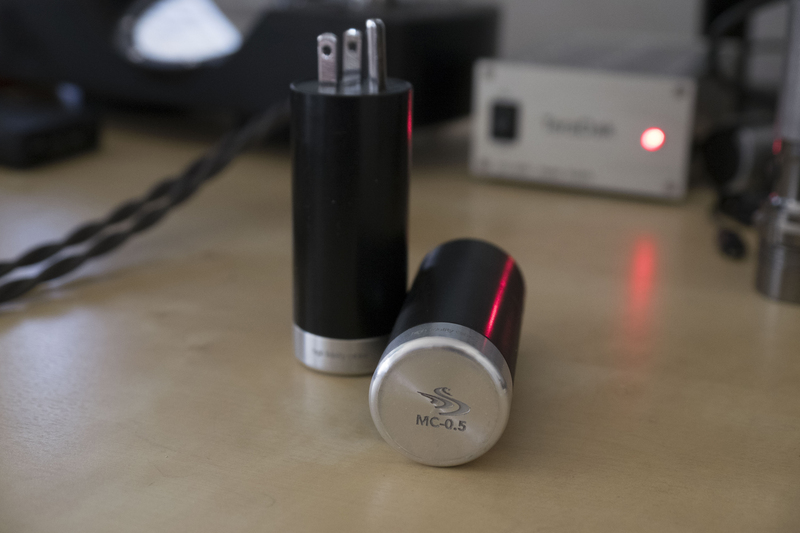 With 3 MC-0.5s, it tames that treble down. The CT-1 has a grainy and abrasive treble, while the CT-1U was very smooth and real. When I add all 4, the vocals are much better. Closer to the CT-1U. The CT-1 + 4 x MCs can’t touch the CT-1U on its own. The sound is so much more natural and musical on the CT-1U. Hands-down. Adding MCs onto the CT-1U is too much though (beyond 2). Thank you for the review and posting it. I see in one of the pictures that you plugged the High Fidelity power cord into the 3 way splitter with 2 MC O.5s. Did you try the power cord direct to the wall with the splitter plugged into the same wall socket with 2 or 3 MC O.5s plugged into the splitter. If so what was the differences? Did you find that using the High Fidelity power cords better to feed the Hemisphere or plugged into your equipment then plugged into the Hemisphere? (Before the Hemisphere or after). How much time where the High Fidelity product given in any one position before you moved them around? Hey Pete! I tried using a splitter on each outlet with 2 x MCs on each splitter and using a single outlet with 2 splitters…and I got similar results. HFC suggests using the higher quality HFC cable on the source/equipment. I’ll check how it sounds with the Ultimate before the Hemisphere and let you know the differences I hear. I have a feeling it won’t be as great. 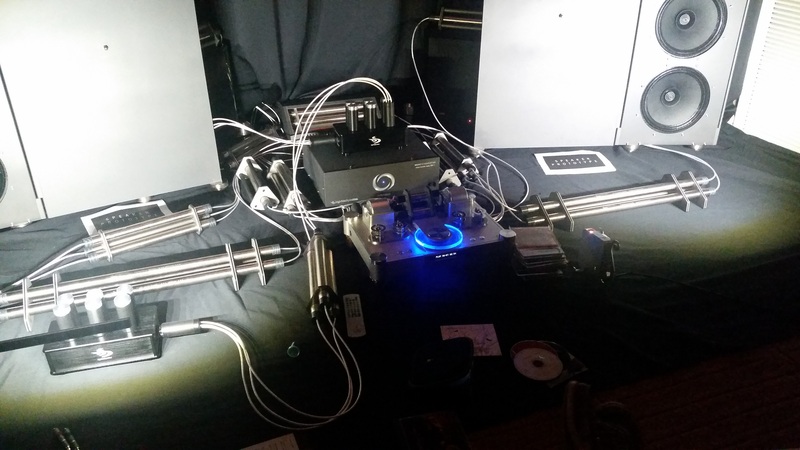 The entire system was magnetized for over a month. Supposedly if components are swapped in and out without much time in-between, the presentation should be as if the components (like the MCs) were already settled into the system. I listened to this system everyday for a few months, trying out different configurations. Sometimes quick swaps, sometimes just letting it sit. Wrote notes everyday and aggregated them to make sure my impressions were consistent across genres, tracks, and even across days of listening. So with the Ultimate to the Hemisphere and CT-1 on the DAVE, you still get great sound but it’s not as holographic, separation isn’t as great, not as much shine and energy. Low-end presence and weight is also a bit muted in comparison. Bottom line: You get more realism by using the Ultimate on the DAVE. Using multiple MC-0.5s enables me to continue utilization of previous P/C purchases . `Agree well worth the incontrovertible improvement . Sometimes this crazy hobby “pans out” . I have two MC 0.5s and one CT-1 power cord. This review has helped greatly in my overall conclusions so far. In my case, I use one MC 0.5 on the output of a Richard Grey Sub Station. I found the second one pushed the sound into slight harshness. Using one is quite better than none. This saves me the expense of buying more. My second one is now free to use elsewhere. The CT-1 power cord has its deficiencies to my ears, and I plan to get a CT-1 Ultimate, or the Enhanced, depending on my budget. I will try the CT-1 on some power supplies first, before selling or trading in. Hey Bill! Very similar to my impressions. To say the CT-1 Ultimate is in another league is an understatement. It’s really that good. Thanks for your feedback! Thanks for the feed back great review.